Starting at a new school can be tough for students, but it can also be tough for new teachers as well. That’s why the Eastern Camden County Regional Board of Education took some time at its June meeting to honor this year’s “mentor” teachers — those who have been with the district for a number of years and who helped mentor new teachers who started at Eastern this year. Mentor teacher Richard Colton said there was a larger than average group of new faculty members at Eastern this year, and therefore the district needed strong faculty members to step up and take the lead in shepherding the district’s new hires. Colton said mentor teachers would guide the teachers they were mentoring through simple questions such as where bathrooms are located, to more complex issues such as learning the unique requirements of each of Eastern’s three sending districts. “I think that we had some really outstanding mentor teachers working with our novice, first-year teachers, so I’d just like to thank them for their work,” Colton said. In addition to Colton, mentor teachers honored at the meeting were social studies teachers Bradley Trinkner and Michael Hering, performing arts teacher Katherine Akinskas and math teacher Denise Brandt. • The board also honored the students who work on Eastern Regional High School’s newspaper, The Voyager. 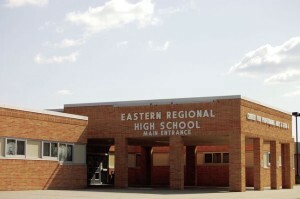 Superintendent Harold Melleby Jr. said students who work on The Voyager might not always receive the acclaim and attention many Eastern’s other groups of students receive, so he wanted draw attention to their work. Earlier this year, The Voyager earned a first-place ranking in the nation from The American Scholastic Press Association for the fourth year in a row and won “Overall Excellence” from the Garden State Press Association. “It’s just an outstanding publication and we’re so proud of the work that our students do,” Melleby said. Voyager advisor Walter Bowne described the paper’s staff as small but dedicated, and he told Voyager students at the meeting that he would put their writing against that of anyone else in the state. “Having these things (the awards) is just validation of the hard work that you guys do each and every day,” Bowne said.